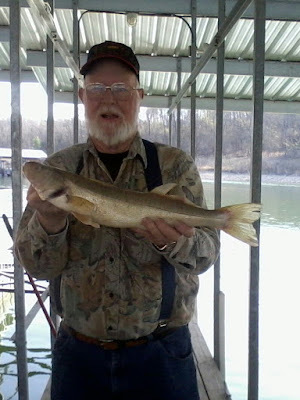 Norfork Lake fishing has entered into the spring phase and is getting exciting. With that being said, I need to clarify that early spring can bring many drastic changes in the weather. As a few weeks ago we went from the 80's to a 3 inch snowfall and cold for several days, followed by a return to summer like temperatures. 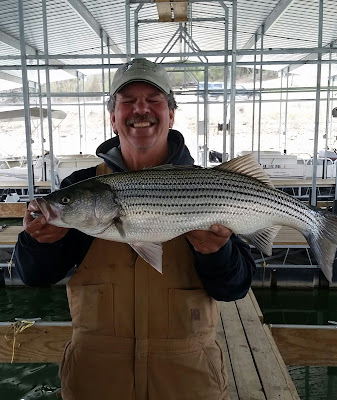 This type of weather affects the water temperature which in turn affects the bite. These weather changes seem to be the norm for March. Temperatures typically stablize in April. 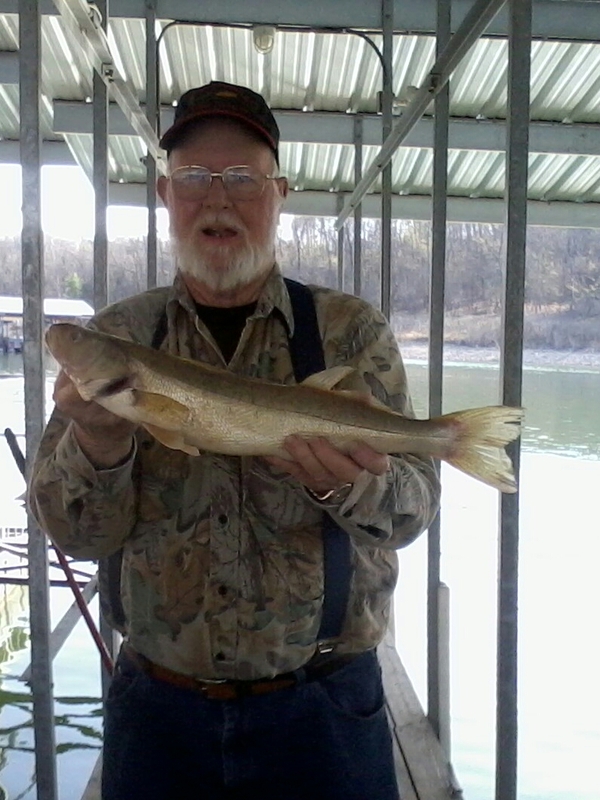 The lake water temperature has warmed back to the low 60's which is a perfect temperature for all species. Striped bass, hybrid bass and white bass fishing is improving each day I go out. Today was no different. 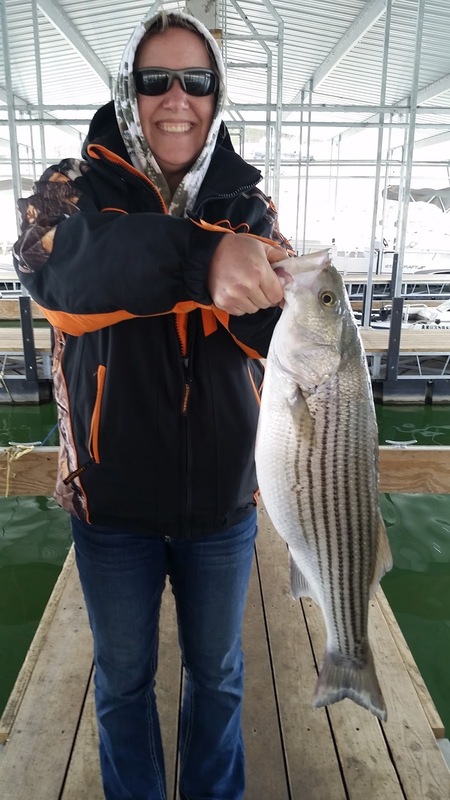 The clear skies made for a slow bite for me early, but by 10AM I found the stripers and landed 3 striped bass, 1 hybrid and 3 whites. I first started out on a large flat up river where the water had turned off color. 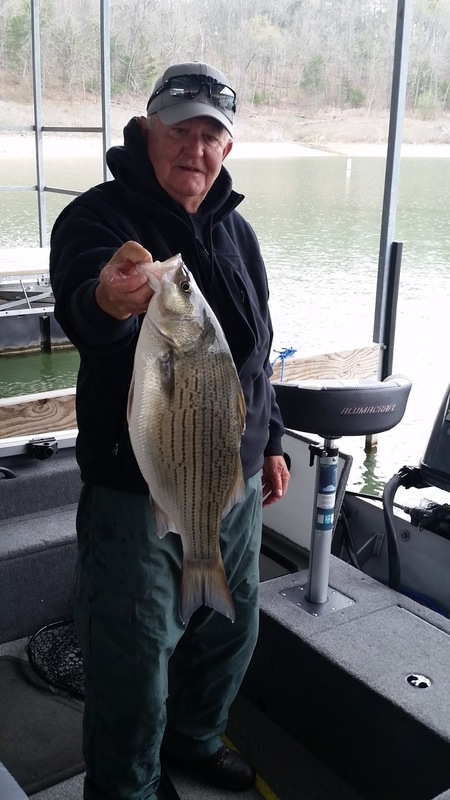 (slightly greenish brown) My guests and I had been finding large schools of stripers, hybrids and whites at all different times of day, but today I could not locate them early. I also checked out several deep brush piles since I have found that the striped bass were relating to the brush that is holding bait fish, but again no takers. I moved to a deep water point at a mouth of a cove about 1/2 mile away from the flat and I found bait fish and lots of suspended feeding fish. 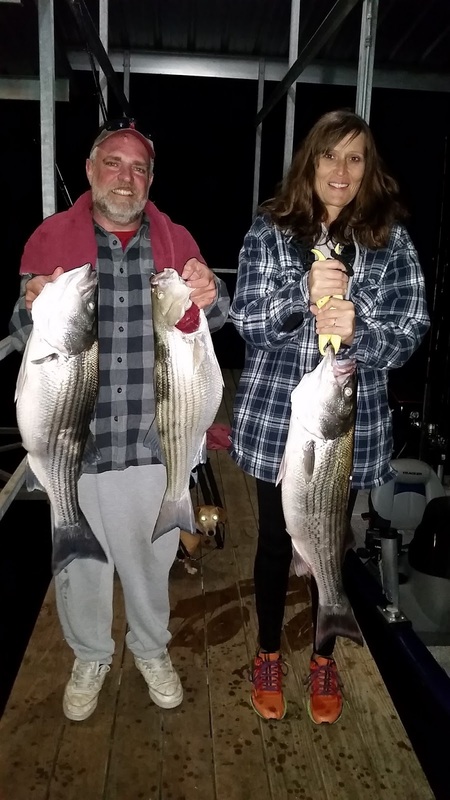 I was in 55 feet of water and the stripers were anywhere from the surface to 25 feet down. 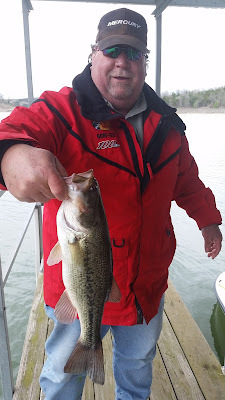 I was vertical jigging and had one pole out with live bait and a very small split shot. This rod got buried and I finally landed a nice 14 pound striper. I decided to set out 2 live bait poles and continued to move around the point. I was also jigging a spoon at about 25 feet and hooked up to 2 white bass. After releasing the second white, I looked back and one of rods was doubled over. As I was fighting this fish the second rod took off. Fun and games a double. Ended up landing both of the stripers without any mishaps. :-) I have also been fishing back in a major creek, again where the water turns off color. I have found stripers on the deep water bluff line side just inside of the creek channel as well as on points that have deep water nearby. 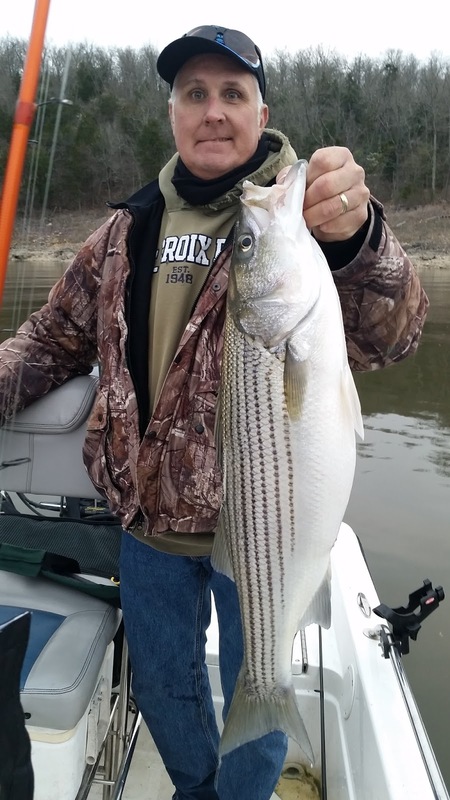 Some of the creeks have big flat areas where the stripers will be roaming in the shallower water early and late in the day. The stripers that I have marked and caught have been mainly from the surface to 25 feet deep in all my fishing spots. Vertical jigging with a spoon, live bait and trolling with Alabama rigs, swim baits and long stick baits will work. Crappie fishing is also improving. My guests and I have been finding crappie on deep brush piles in 30 - 40 feet. of water. Several of us have been jigging with a 1/4 ounce spoon and some others have been using 1/16th and 1/8th ounce Roadrunners in white and white/chartreuse. I do believe the crappie are moving up to the shallow water to spawn. Many of the larger crappie are coming off the shoreline hitting roadrunners and small grubs. 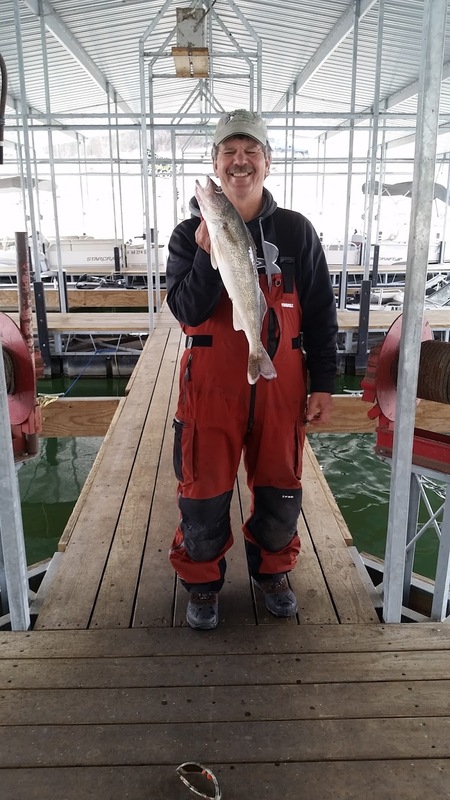 Most of the walleye have finished their spawn and are moving onto the shallower flats, as well as, to brush piles. I have caught walleye on flats dragging a large minnow on the bottom and by vertical jigging with a spoon. Deep diving crank baits will also pick up some nice walleye on these flats. I have also picked up a few along the shoreline before daybreak throwing a white/ chartreuse Zoom Fluke. This bite will continue to improve during the morning and on through the day and after dark. The largemouth bass bite finally starting to improve after the cold snap. I was starting to get into some nice top water action before our snow, but since that time I have noticed very few bass coming up. The water temperature has finally got back to the low 60's so top water action will take off very soon. 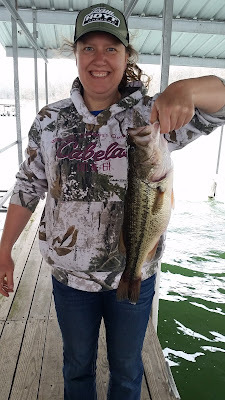 There are some fish moving into the shallow water, but still I am marking lots of bass staging off of deep water points in about 20 - 25 feet of water, either on the bottom or suspended. The Norfork Lake surface water temperature this morning started out at 60 degrees at 6AM and ended up at 62 degrees at 11AM (main lake temps). The creeks and coves are stained and off color, the main lake is somewhat stained. The current level of the lake has risen to 549.0 which is a 5 feet increase over the last couple of weeks. This lake level is still about 5 feet below the current seasonal pool.